First Year: The core curriculum at Rice Business is designed for full-time MBA students ready for a major transition. 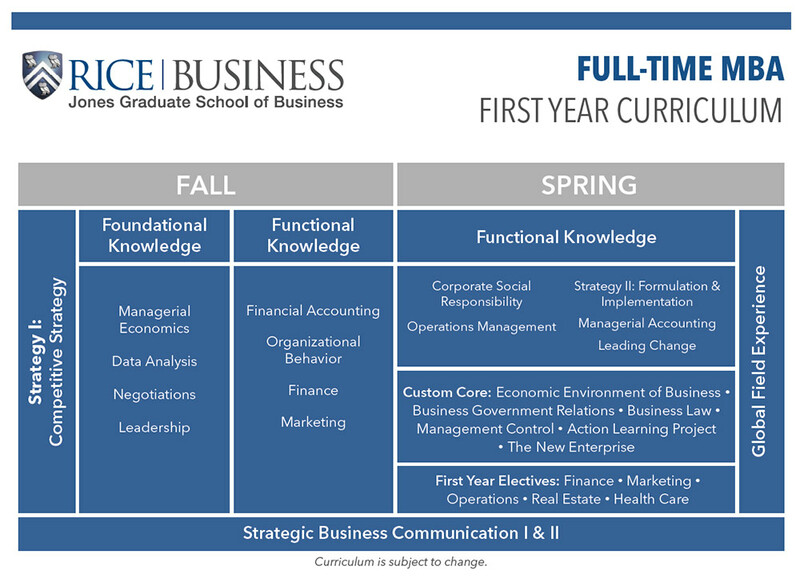 Our core classes — which are required during full-time students' first year — include the following foundational building blocks for tomorrow's business leaders: data analysis, finance, managerial economics, marketing, financial accounting, strategy formulation and implementation, ethics, organizational behavior, communications and more. Second Year: Once core requirements have been fulfilled, second year students have more than 100 electives to choose from. Areas of study as electives include managerial accounting, corporate responsibility, government relations, operations management, portfolio management, applied predictive modeling, applied risk management, energy derivatives, corporate real estate, brand management, business law, and more. You can review and explore our current course catalog for Full-Time MBA students online.